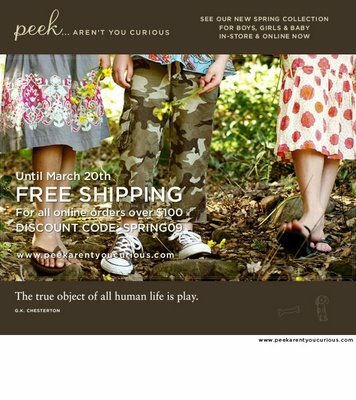 Our friends at Peek…Aren’t You Curious have updated their website with some images from the spring photo shoot. I have always loved the playful and interesting nature of the site and feel so honored to have my work showcased on the homepage! Check it out HERE and let me know what you think…are you as in love with the clothes as I am?? Don’t you think that they should make both of the above skirts in grown-up sizes? 1. Jo, you are a Rock Star. 2. Just saw on their site that they now have a store in Glendale, near us! We’ll have to check it out.